There are so many choices out there for air filtration for your house. The ones that we’ll be referencing in this article pertain to whole home air filtration. The basic concept of whole home air filtration is the air filter gets installed next to your home furnace. Then you can set your fan to run as long as 24 hours per day, bringing the air in from various parts of the house and returning it through your duct system, thereby filtering all of the air in your house. 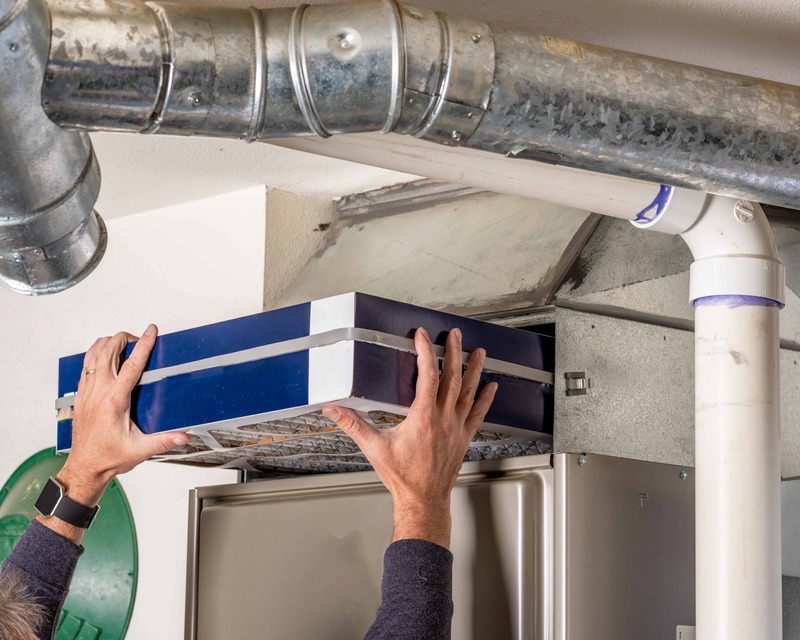 On average, it will create two air exchanges per day, meaning all of the air in your entire house will be taken through the filter and put back in your house, oftentimes significantly reducing dust, pollen, allergens, and so forth. The challenge and confusion comes from all the various products available on the market. On the higher end, you have air filtrations similar to the American standard Acuclean. These work amazingly, we suggest that unless you have asthma or allergy specifically, a product like this is probably overkill. Another option is UV lights. UV Lights are more of a supplement to air filtration. However, in our opinion, they are not terribly purposeful, unless you have a wet environment like a heat pump or an air conditioner. The next choice is electronic air filters. Their problem is that some of them make a cracking, snapping sound, similar to a bug zapper. Then you have your basic wide, pleated filters. Baring specific issues like very small particle size related to lung or health problems, I’d suggest going with just a basic, disposable filter. The problem with cleanable filters is that nobody ever cleans them. Disposables are a great solution because you can just throw them out when you’re not using them. If you go with a big, wide, 5-inch filter, you’ll find that you only need to throw it out once per year because there’s much more surface area on the filter, and it can go much longer intervals without getting plugged up. If you have a regular filter and it plugs up, fuel efficiency goes in the toilet, so you end up having to change it much more often that otherwise necessary.